like it. Scroll down to view pendants that are for sale. rectangular cubic zirconium stone. All wire elements were fashioned by me by hand. new pendant done in this style just for you are welcome. $150. Free shipping. Allow 3 weeks. place a custom order. $200. Free shipping. Please allow 3 weeks. wire-sculpted by me with anti-tarnish sterling silver. piece like this are welcome. $300. Free shipping. Allow 3 weeks. Note: in real life this stone is perfectly clear; colors in the photo are camera and lighting artifacts. Scroll down to see more pendants. Rolliana wire-wrapped this piece on 12/26/10 and shows it here because it turned out very well. visited there 2 years ago. Being a special, personal memento, it is not for sale. Please scroll down to view pendants that are for sale. 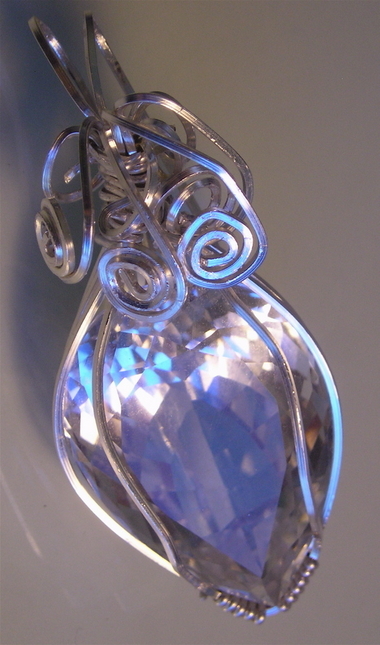 Below is a slide show of several Antonía Pendants offered at "artist-direct" prices. to be sure what you want is still available. see the collection in person. paying sales tax should include their sellers' permit number with their orders. Thank you. 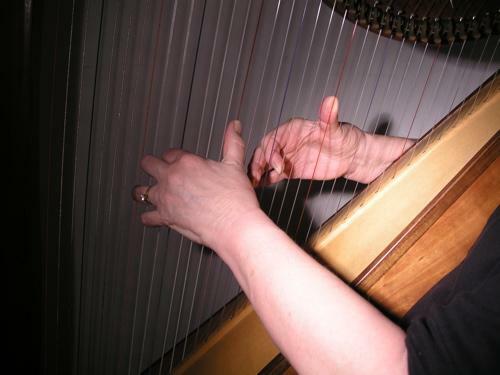 many of her materials here. Click on the banner if you wish to learn, too: . Rolliana has been learning how to fuse glass and has been using her own cabs for her jewelry. "21" or "22". Bails are large enough to accommodate most necklaces, chains or cords. more time-consuming to do than standard "wire-wrapping". Scroll down for item descriptions and measurements--they are more reliable than the photos. Please disregard reflections from overhead lamp in the photos. Take a look also at RollianaGlass, Rolliana's jewelry without wire work. 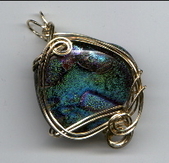 #131 - Donated - Dichroic glass, soft rectangle, 28 x 30 mm, with multi greens, blues and golds. Hand wire-sculpted with 14/20 gold filled. Finished size: 2.125" x 1.25"
with anti-tarnish sterling silver. Finished size: 2.25" x 1.25"
sterling silver wire. Finished size: 2.25" x 1.375"
14kt gold fill [aka 14/20 rolled gold]. Finished size: 1.375 x 2.25"
the photo are not accurate. 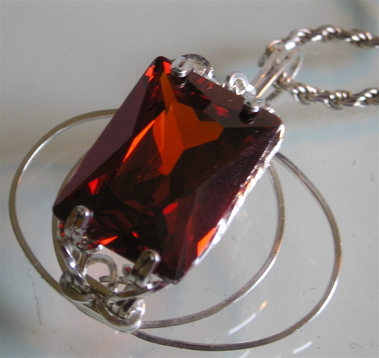 Finished size: 2.25" x 1.125"
inclusions that appear burgundy in color. Sculpted with anti-tarnish sterling silver wire. 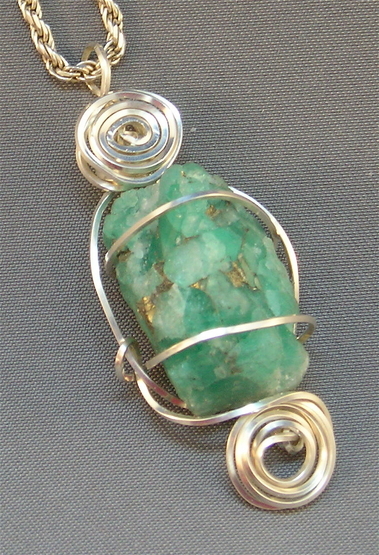 Finished size: 2.5" x 1.25"
decorated with coils using anti-tarnish sterling silver wire. Finished size: 2.375" x 1.25"
with 14/20 rolled gold wire. Finished size: 2.5" x 1.25"
#116 - $95 Dichroic glass, oval, 32 x 28 mm. Streaky silver and translucent medium blue. Sculpted with anti-tarnish .925 sterling silver wire. Finished size: 2.25" x 1.25"
with 14 kt gold-filled wire. Finished size: 2.25" x 1.5"
pale green. Sculpted with anti-tarnish .925 sterling silver wire. Finished size: 2.25" x 1.25"
multi-colors--almost looks like an opal. Sculpted with anti-tarnish .925 sterling silver wire. Finished size: 1.75" x 1"
blue base. Sculpted with 14 kt gold-filled wire. Finished size: 2.5" x 1.375"
#107 - Donated - Dichroic glass, soft rectangle, 26 x 40 mm. Streaky intense blues, greens and purples. Sculpted with 14 kt gold-filled wire. Finished size: 2.75" x 1.125"
wire. Finished size: 2.375" x .75"
gold-filled wire. Finished size: 2.375" x 1"
#103 - $Donated - Dichroic glass, soft rectangle, 18 x 30 mm. Translucent gold with orange spirals. Sculpted with 14 kt gold-filled wire. Finished size: 2.125" x .75"
#102 - $56 Dichroic glass, soft rectangle, 20 x 30 mm. Apple green with aqua spirals. Sculpted with 14 kt gold-filled wire. Finished size: 2.25" x 1.125". 14 kt gold-filled wire. Finished size: 2.5" x 1.75"
#97 - $95 Dichroic glass, large trapezoid, 46 x 30 mm. Blues, purple, greens on green base. Sculpted with 14 kt gold-filled wire. Finished size about 3" x 1.5". gold-filled wire. Finished size about 2.25" x 1.25". dark blue base. Sculpted with 14 kt gold-filled wire. Finished size: 2" x 1.25". #94 - $82 Dichroic glass, large,oval, 30 x 40 mm. Blue, green, purple, black swirl on black base. Sculpted with 14 kt gold-filled wire. Finished size: 2.5" x 1.25". with 14 kt gold-filled wire. Finished size: 2.5" x 1.5". 14 kt gold-filled wire. Finished size: 2.25" x .875". and black on black base. Sculpted with 14 kt gold-filled wire. Finished size: 2.375" x 1.375". yellow, green and teal on black base. Sculpted with 14 kt gold-filled wire. Finished size: 2.75" x 1.25". navy blue. Sculpted with 14 kt gold-filled wire. Finished size: 2.5" x 1.25". #77 - $45 Dichroic glass, pointed oval, 34 x 20 mm. Purple and pink sparkle with a little white. Sculpted with 14 kt gold-filled wire. Finished size about 2.25" x 1.125". #76 - $95 Dichroic glass, oval, 34 x 24 mm. Multi-colored sparkles on translucent wine. Sculpted with 14 kt gold-filled wire. Finished size about 2.25" x 1.25". copper and teal on blue base. Sculpted with 14 kt gold-filled wire. Finished size about 2.25" x 1.125". #73 - $45 Dichroic glass, teardrop, 31 x 24 mm. Clear aqua. Sculpted with sterling silver wire. Finished size about 2" x 1". wire. Finished size about 2.5" x .75". #68 - $55 Dichroic glass, oval, 21 x 18 mm. Black with central geometric shape in teal. Sculpted with sterling silver wire. Finished size about 1.75" x .875". #63 - $50 Dichroic glass, soft square, 18 x 18 mm. Silver and multi-colored sparkles on blue base. Sculpted with sterling silver wire. Finished size about 2.25" x 1.25". #62 - $50 Dichroic glass, oval, 22 x 18 mm. Clear aqua with pale multi-colored sparkles. Sculpted with 14 kt gold-filled wire. Finished size about 1.75" x 1". red, copper, lavender, yellow. Sculpted with 14 kt gold-filled wire. Finished size about 2.625" x 1.375". orange. Sculpted with 14 kt gold-filled wire. Finished size about 2.75" x 1.75". sparkly gold and multi-colored dichro inclusion. Sculpted with 14 kt gold-filled wire. Finished size about 2.375" x 1.25". green and gold. Sculpted with 14 kt gold-filled wire. Finished size about 2.25" x 1.25". #44 - $95 Dichroic glass cabochon, 32 x 23 mm, soft triangle. Mostly greens with touches of blue. Sculpted with sterling silver wire. Finished size about 2.25" x 1.125". turquoise accents [much lighter and icy-er than photo can show]. Sculpted with sterling silver wire. Finished size about 2.25" x 1.25". [aka 14 kt rolled gold] wire. Finished size about 2.5" x 1.375". little raspberry. Sculpted with 14/20 gold filled [aka 14 kt rolled gold] wire. Finished size about 2.5" x 1.25". black base. Sculpted with 14/20 gold filled wire. Finished size about 3" x 1.625". silver wire. Finished size about 2.75" x 1.125". purple. Sculpted with 14kt rolled gold wire. Finished size about 2.5" x 1.5". mostly blues and some greens on black base. Sculpted with 14kt white rolled gold wire. Finished size about 2.625" x 1.5". and some matte, plus a little blue. Sculpted with 14kt rolled gold wire. Finished size about 2.5" x 1.125". #31 - $50 Dichroic glass, trapezoid, 34 x 24 mm, translucent blues and multi on cobalt. Sculpted with 14kt rolled gold wire. Finished size about 2.625" x 1.125". #28 - $50 Dichroic glass, teardrop, 30 x 22 mm, purple with multi-sparkles on black. Hand wire-sculpted with 14/20 rolled gold. Finished size: about 2.375" high x .875" wide. with 14/20 white rolled gold. Finished size: about 2" high x 1.125" wide. white rolled gold. Finished size: about 2.125" high x 1" wide. 14/20 rolled gold. Finished size: about 2.625" high x 1.625" wide. remind one of Japanese Ikebana. Hand wire-sculpted with 14/20 rolled gold. Finished size: about 2.25" high x 1.25" wide. 14/20 rolled gold. Finished size: about 2.125" high x 1.25" wide. rivers of purple. Hand wire-sculpted with 14/20 rolled gold. Finished size: about 2.75" high x 1.75" wide. #10 - $65 Amethyst gemstone cabochon, 25 x 18 mm, sculpted with 14/20 rolled gold wire. Finished size: about 2" high x 1.125" wide. green, lavender and gold, sculpted with 14/20 rolled gold wire. Finished size: about 2.5" high x 1.125" wide. white. Sculpted with 14kt gold-filled wire. Finished size about 2.75" high x 1.75" wide. generations. Owners are encouraged to pass them on. yourself or your gift recipient wearing jewelry like everyone else's. artist before purchase if you wish shipping outside continental USA. Email artist. pay sales tax should send a copy of their sellers' permit to Rolliana.